President Donald Trump wants the new Gerald Ford-class aircraft carriers to use older steam catapults to launch aircraft rather than the new electromagnetic launch system that the Navy has been developing for more than a decade. The unexpected comments from Trump came during a wide-ranging interview with Time magazine that were published on Thursday. 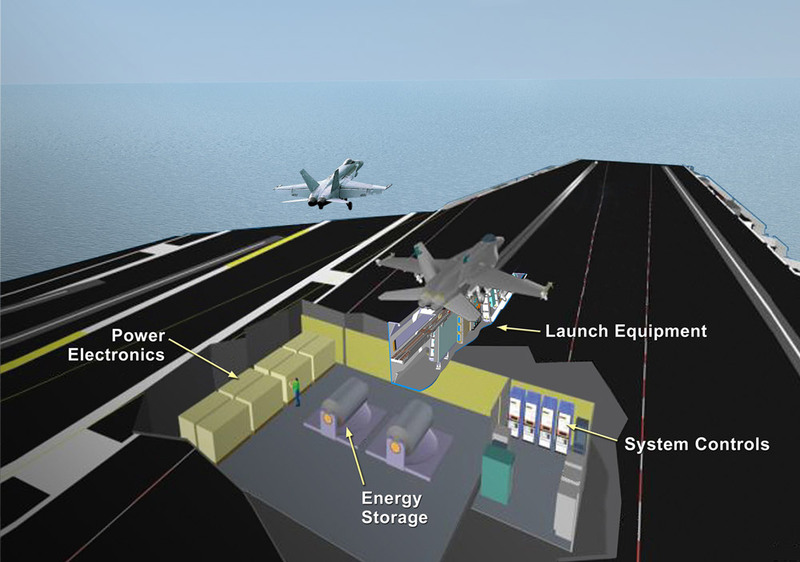 Trump referred negatively to the “digital catapult system” – a reference to the General Atomics Electromagnetic Aircraft Launch System (EMALS) – and said it would take “Albert Einstein to figure it out.” Trump stated his preference for the Ford-class carriers to use the older Mk 13 steam catapult system that is used on the Nimitz-class carriers and the French carrier Charles de Gaulle (R 91). “It sounded bad to me. Digital. They have digital. What is digital? And it’s very complicated, you have to be Albert Einstein to figure it out,” Trump said, according to the published interview. A spokesperson for Ford-class shipbuilder Huntington Ingalls Industries referred questions on Trump’s comments to the Navy. A General Atomics spokeswoman who works with the EMALS program also referred questions on Trump’s comments to the Navy. A spokesman for the National Security Council acknowledged a USNI News request for more information on Trump’s intentions but has not yet provided additional clarity on the issue. EMALS is already installed on Gerald R. Ford (CVN-78), and in 2015 the Navy began buying materials for EMALS on the follow-on John F. Kennedy (CVN-79). In January, the service awarded a $527 million contract to General Atomics for EMALS on the third Ford-class carrier, Enterprise (CVN-80). While early EMALS development was challenging for the service and slipped in cost and schedule, the Navy has been a vocal supporter of the launching system in the last several years. It’s yet unclear how much influence the president can have on previously made decisions to use specific government furnished equipment in already agreed upon shipbuilding contracts. 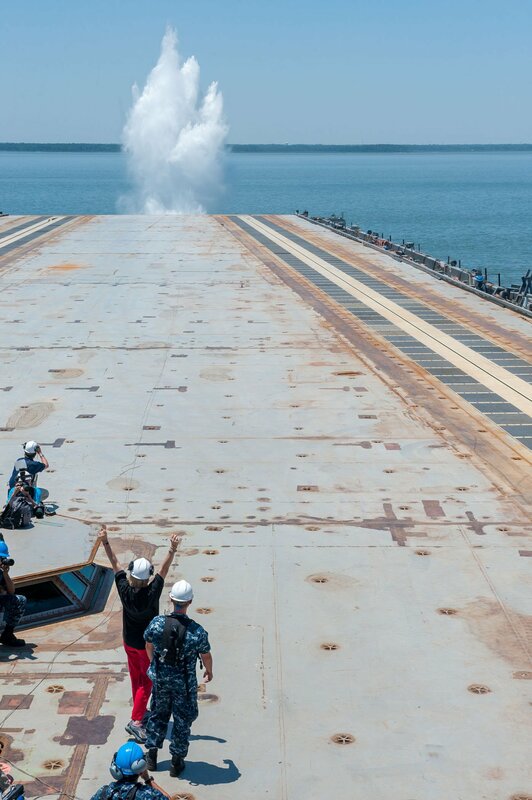 The Mk 13 steam catapult used on Nimitz-class carriers is no longer in production, and if the service elected to return to steam launching it would likely have to design a new system, with the Navy incurring an unknown level of additional expense, USNI News understands. From the transcript published by Time, it’s unclear with whom Trump spoke about the EMALS system and when. On March 2, Trump visited Gerald Ford, during which time he took a brief tour of the carrier and spoke with several members of the crew. 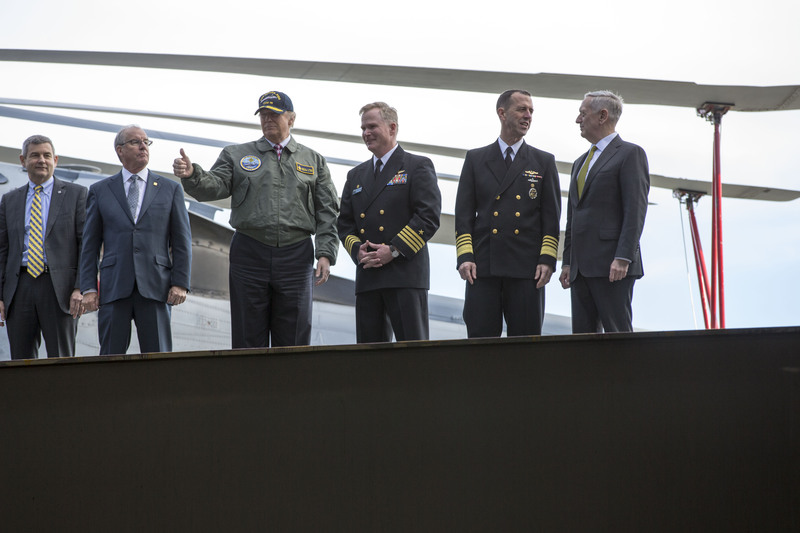 Also aboard for the visit was Chief of Naval Operations Adm. John Richardson, HII CEO Mike Petters, HII Chairman Tom Fargo, Secretary of Defense James Mattis and Ford’s commanding officer Capt. Richard McCormack. During the transition period after the November election, Trump also met with Vice CNO Adm. Bill Moran, Naval Sea Systems Command commander Vice Adm. Tom Moore and acting Secretary of the Navy Sean Stackley to discuss, among other topics, Ford-class development. 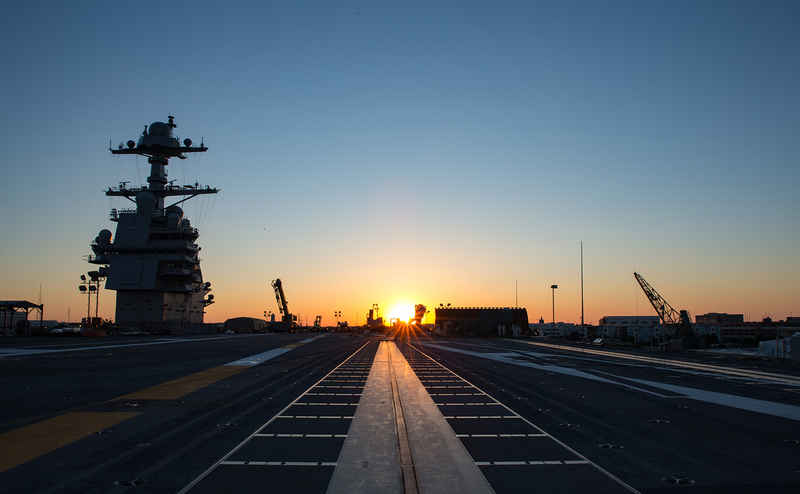 The Navy’s decision to introduce three new major warfighting systems into the Ford class has proved a controversial one, but of the three – EMALS, the Advanced Arresting Gear and the Dual-Band Radar – EMALS by all accounts appears to be the biggest success. Moore, the current NAVSEA commander who previously served as the Program Executive Officer for Aircraft Carriers, lumped the three technologies together in 2013 when discussing cost overruns. He told reporters that rising costs of the three major systems accounted for 40 percent of the overall cost overruns for the first-in-class Gerald R. Ford, though he did not break that down between EMALS, AAG and DBR. Despite early challenges, Moore and others were thrilled with the system’s performance once it made it through land-based testing and was installed aboard Ford for shipboard testing. “For the first time in over 60 years, we’ve just conducted 22 no-load test shots using electricity instead of steam technology,” Moore said in May 2015. Once EMALS started dead-load testing – where EMALS catapulted hunks of metal designed to mirror the weight of various aircraft types – Moore called EMALS “probably one of the best news stories in the (carrier) program” and said the system “worked like a champ” during early dead-load testing. The system did encounter its share of failures during testing – including a case of “unfortunate timing” when the shipbuilding team brought reporters out for the first public EMALS demonstration in June 2015 and the system failed due to communications issues amongst components, despite working the day before and then working again later that afternoon after the press had left. 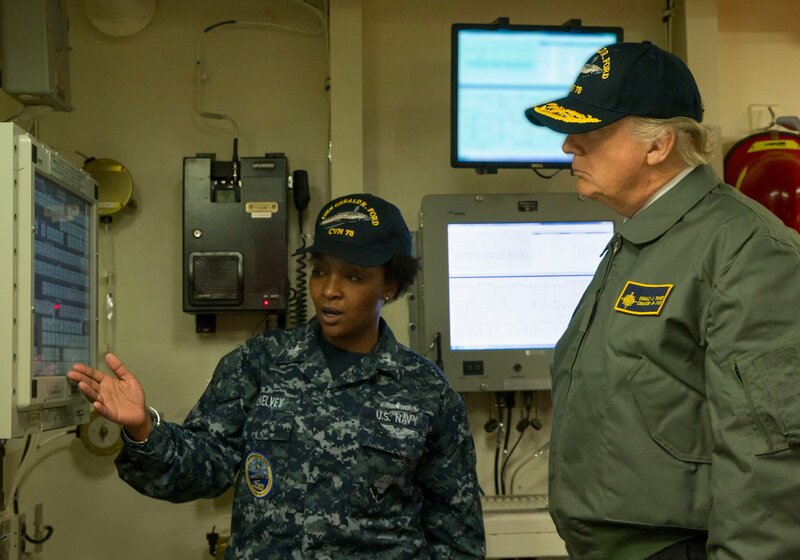 Those challenges were chalked up to growing pains, and by a year later then- CVN-78 class program manager Capt. Chris Meyer told USNI News that the entire collection of test data proved EMALS was more reliable than had been predicted. Still, in August 2016 the Pentagon called for a 60-day review of the entire Ford-class carrier program, to include a focus on five systems, including EMALS. The Pentagon memo cited “the lack of sufficient reliability growth demonstrated to date and the ability to support both surge and sustained aircraft operations” as the reason for a review of EMALS, despite Navy statements that cost had since stabilized and reliability was better than expected. Ultimately, for the Navy, EMALS represents more than just a new way of launching airplanes. Steam catapults put a lot of stress on the airplanes getting shot off the front of the carrier, and therefore the planes have to be built sturdy enough to withstand those pressures – which means they end up being heavy. As a result, Moore and then-Director of Air Warfare Rear Adm. Michael Manazir explained in 2015, any engineer trying to design a future naval aircraft will end up with a design like the F/A-18 Hornet, the EA-18G Growler or the F-35C Joint Strike Fighter. With EMALS, though, the electromagnetic field creates a smoother acceleration and doesn’t subject the aircraft to steam. Along with the new AAG, which refines how it stops an airplane based on its weight, “what it also does is open up … the envelope for lower-weight aircraft. So as we start exploring where we’re heading with unmanned aircraft, it gives us a lot of flexibility from a warfighting standpoint that the (legacy system) doesn’t,” Moore said. “You can now start to do things with aircraft design that you couldn’t do before. It might allow us some more margin in weight, in size, and in structure and capability,” Manazir added. The following is the excerpt from the Time magazine interview on the subject of the Ford-class carriers. Sam LaGrone is the editor of USNI News. Megan Eckstein is USNI News’ senior staff writer.